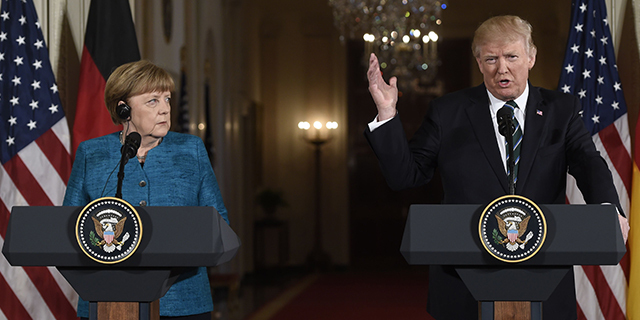 As leaders from 20 of the world’s largest economies prepare to meet in Germany this week for the Group of Twenty (G2o) summit, residents in most member countries have more confidence in the summit’s host – German Chancellor Angela Merkel – than in U.S. President Donald Trump to do the right thing in world affairs, according to a new Pew Research Center survey. Across the majority of the G20 nations, people prefer Merkel to Trump on world affairs, according to the survey, which examines attitudes in 37 nations, including in 17 of the 19 members of the G20 (the organization also includes a representative of the European Union). In only two of the G20 countries surveyed – India and Russia – do residents have substantially more confidence in Trump than in Merkel when it comes to world affairs. In the United States, more people have confidence in Merkel than in their own leader (56% to 46%). However, there is a sharp partisan divide in the U.S. on this question. Democrats trust Merkel (64% confidence) more than Trump (16%). Republicans, on the other hand, have much more faith in Trump (89%) than the German leader (50%). There are only a few G20 countries where Merkel does not have this confidence advantage. Residents of Turkey have comparatively little confidence in either leader. More in India have confidence in Trump than in Merkel (although 63% do not have an opinion of the German leader). Meanwhile, in Russia, 53% have confidence in Trump, compared with 31% who have confidence in Merkel. Russia was one of only two countries in the Center’s new survey – the other being Israel – where opinions of Trump were higher than they were for Barack Obama at the end of this presidency. When it comes to two of the key issues that will be discussed at the G20 summit – trade and climate change – most people in G20 member countries take a dim view of Trump’s policy proposals. For example, on Trump’s intention to pull out of international trade agreements, such as the Trans-Pacific Partnership, there is broad disapproval across the 17 G20 countries included in the survey. In the U.S., only 38% approve of such policies, though Republicans are far more likely to approve (66%) than Democrats (17%). 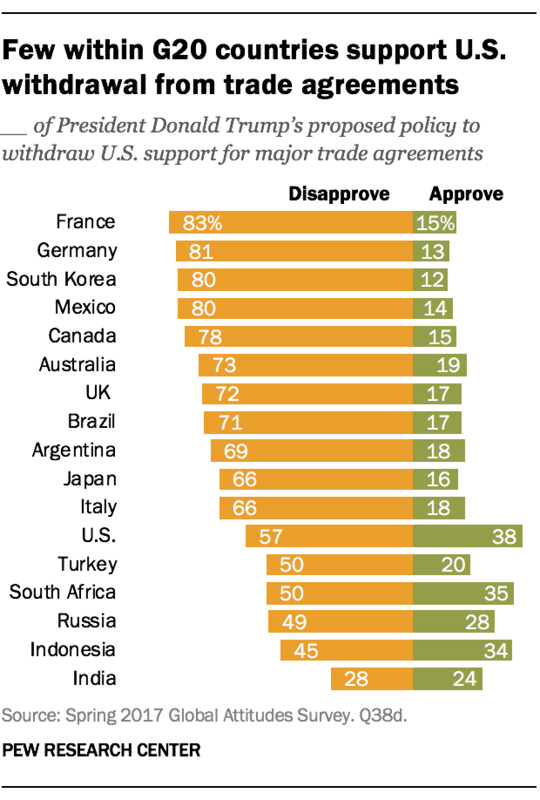 In France, Germany, South Korea and Mexico, eight-in-ten or more disapprove of pulling out of these trade agreements. Roughly half of Russians (49%) disapprove, compared with 28% who approve. Climate change, and specifically the Paris climate accord, will also be on the agenda during the G20 summit. And although the Center’s survey was fielded before Trump’s announcement that the U.S. would leave the accord, most people in G20 member countries say they disapprove of his stated plan to do so. 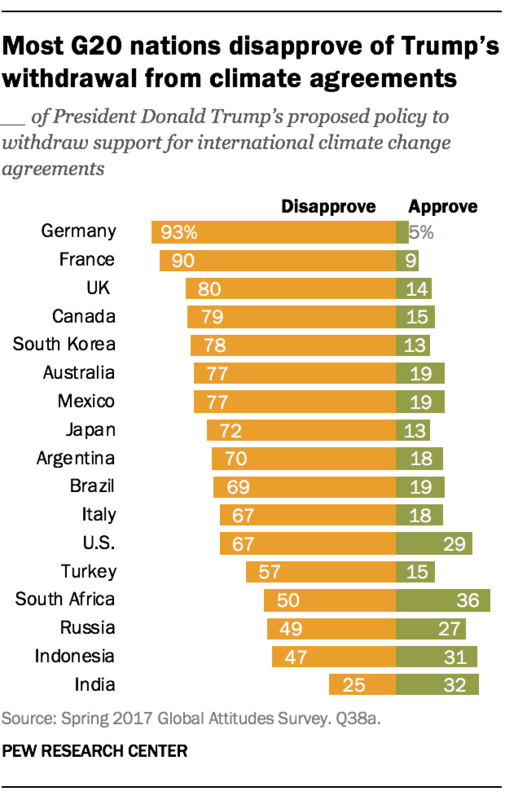 The strongest disapproval is in Germany, where 93% disapprove of the plan to leave the climate accord. But there is also strong disapproval across Western Europe, East Asia and Latin America. In the U.S., 67% disapprove of Trump’s plan to leave the climate change agreement, though again, Democrats express more disapproval on this policy (88% disapprove) than Republicans (34%). In India, the country with the fourth-largest carbon dioxide emissions behind China, the U.S. and the EU, 32% approve of Trump’s pulling out of climate accords, but 25% disapprove and most (43%) do not have an opinion. Note: See for topline results of our survey and methodology.